The metro system will be closed till Sunday, and the public has been warned to avoid crowds, including shopping centres and concerts, a statement said. The warning for the rest of Belgium stays at a lower level – still serious. 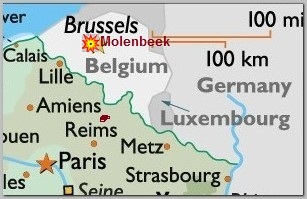 The alert is based, most likely, on the interrogation of 9 terror suspects arrested, most of them, in Molenbeek, almost simultaneously to the French Paris Saint Denis raid, on 11/18/2015 pre-down. Dangerous chemicals were also found among ‘an arsenal’ of weapons in a flat in the Molenbeek district of Brussels that were raided. Talking to French lawmakers, Thursday 11/19/2015, about extending the state of emergency in France, PM Manuel Valls warned that not taking steps to combat ISIS could have dire consequences. For proof, he pointed to their history of executions, bombings, beheadings and added that the use of chemical and biological weapons can’t be ruled out. Belgian PM Charles Michel said Brussels has been placed on its highest level of terror alert in response to information about the risk of an attack like the one in Paris last week. The fear was that “several individuals with arms and explosives could launch an attack… perhaps even in several places”, Mr Michel said. The manhunt after Molenbeek’s resident Salah Abdesalam, the Paris Carnage ringleader, continuous in full gear . The Belgian Security authorities conducted, on Sunday 11/22/2015 might, 22 raids across Brussels and Charleroi, in which 22 more Islamic militant suspects were arrested bu Salah Abdesalam himself managed to slip away, probably to Germany. No weapons or explosives were found during the raids.